In general, I am a big fan of sweet potatoes – except for when they’re made into some sort of overly sweet concoction (I’m looking at you, marshmallow topped sweet potatoes). I need some other savory flavors (specifically, something spicy) to balance out all that sugar. So, when I came across this recipe for a sweet potato salad that included some chipotle chili powder in the dressing, I was immediately sold. It also didn’t hurt that I was in need of a side dish to take to my in-laws’ for Thanksgiving dinner, but I’d have ZERO time to prep it on Thanksgiving day – so I needed to be able to do the bulk of the prep and cooking the night before. The option to serve this particular dish cold was just an added bonus. I will tell you now that this salad got rave reviews. Even my mother-in-law, who is VERY picky, ate a huge helping of it. It was a great balance of sweet and savory (thanks to the rosemary used when roasting the potatoes), with just a slightest hint of heat. It was also incredibly quick and easy to make, so I am planning to make a big batch of it this coming weekend, to enjoy with my work day lunches! 1.) Preheat your oven to 350°. 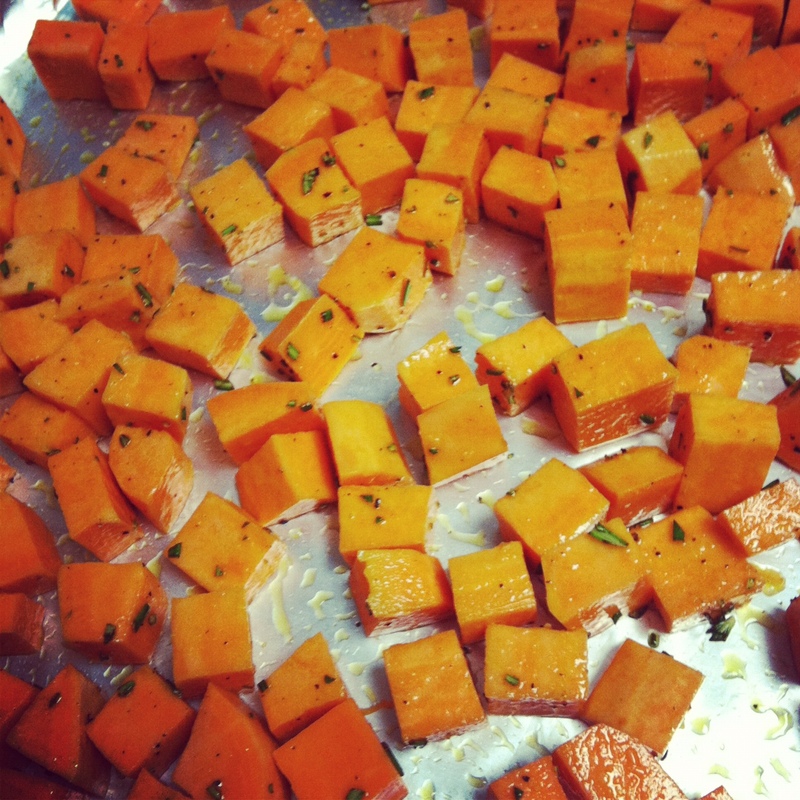 Peel your sweet potatoes and dice into 1/2 inch cubes, doing your best to make sure they’re pretty uniform in size. 2.) 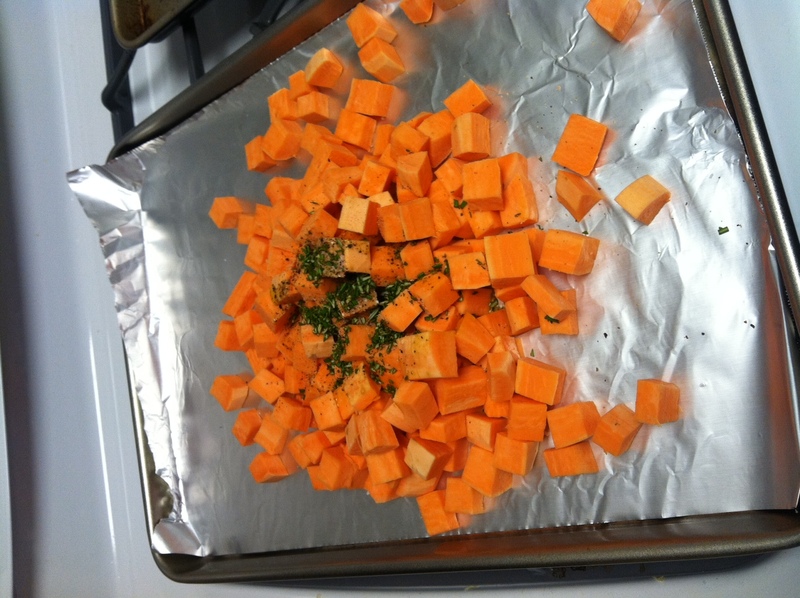 Line a baking sheet with foil (non-stick, if you have it), and place your diced potatoes on it. Toss the potatoes with the olive oil, rosemary, and a healthy pinch each of kosher salt and black pepper. Roast for about 20 minutes – start checking them early to make sure you don’t overcook them. You want them to be fork tender, but NOT mushy – if they’re overcooked, they’ll fall apart when you try to toss them with the other ingredients. 3.) While your potatoes are baking, toast your (whole) pecans. I like to put mine into a dry skillet over medium heat, and toss them every minute or two. Once they are fragrant and lightly browned, they’re done! Remove from the pan, let cool for a few minutes, and chop. 4.) To make your dressing, combine all ingredients and whisk well. If you are REALLY afraid of heat, start with 1/8 or 1/4 teaspoon of the chipotle chili powder. I found that 3/8 was just enough that I could taste the smoke of the chipotles, without a really noticeable heat, but it’s easier to start with less, and add more as you go. 5.) Once your potatoes are tender (but not mushy! ), toss them with the chopped cherries, chopped pecans, and the dressing. You can serve this dish warm, cold, or at room temp. Enjoy! As I said, I will definitely be making this again soon. It required very little time in the kitchen, is relatively healthy, and tastes FANTASTIC. Give it a try! Is this kitchen remodel over with yet?